Ależ ciekawy materiał (i optymistyczny). Polecam (linkuję) znajomym co tu jeszcze nie zaglądali (Szuu i inni). Stosunkowo - jak na moje wyobrażenia o reaktorach - niewielkie rakiety dolecą na Marsa w miesiąc a do Jowisza w rok nieomal. Ciekawy jest etap długiego hamowania ale cóż zrobić - trzeba. Zastanawia mnie w pierwszym linku pierwsza pozycja z Tabeli 1 - co to jest? To znaczy tłumaczenie 1:1 znam ale jak to w pełni ma wyglądać i jak przetwarza energię? Czy dobrze rozumiem, że oprócz pośrednich metod (zamiana energii na elektryczną itd) jest tam też bezpośrednie emitowanie rozpadających się cząstek w jednej z metod? To w 1 miesiąc na Marsa o którym mówił "ekolog" to jest realne? Bo jakoś mi się nie wydaje żeby te napędy jądrowe były aż tak wydajne. Koncepcja wykorzystywanie żagla wykorzystującego efektywnie wiatr słoneczny do napędów sond kosmicznych wraca w rozbudowanej wersji. SPACE travel is expensive. Missions such as Cassini, a recently ended exploration of Saturn and its moons, and New Horizons, a trip to Pluto and one or two more distant objects in the far reaches of the solar system, have involved launching craft weighing hundreds or thousands of kilograms. For big, essentially unique targets such as these, that expense has proved worthwhile. But as exploration moves on to smaller and more numerous objects, like asteroids, individual visits at costs of hundreds of millions, or even billions of dollars are no longer a feasible idea. Some system of mass robotic space travel needs to be devised. And Pekka Janhunen of the Finnish Meteorological Institute in Helsinki thinks he has invented one. In 2004 Dr Janhunen put forward the idea of a sail that harnesses the solar wind, a stream of charged particles emanating from the sun which manifests itself on Earth in the dramatic displays of the aurorae. He and his colleagues have since refined the idea. 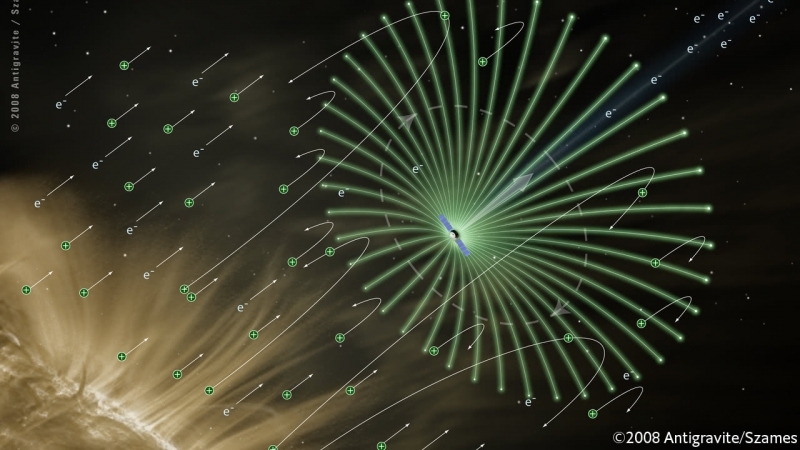 In a paper they presented to the European Planetary Science Congress, in Riga, Latvia on September 19th, they proposed that spacecraft equipped with their new propulsion system could make a round trip to the asteroid belt in little more than three years. A fleet of 50 such craft, weighing about 5kg each and thus capable of being launched by a single rocket, could visit 300 asteroids, survey them and return to Earth for a thrifty €60m ($72m) or so, including the cost of launch. The electric solar wind sail (E-sail), as Dr Janhunen dubs his invention, consists of four wires, each 20km long but just 25 microns (millionths of a metre) thick. These are braided together into a tether. For launch, this tether is wound tightly around a small motorised reel inside the craft. Once in space, the wires are unwound by the motor, assisted by the centripetal force of the spinning craft. Once fully deployed, the tether thus sweeps out a circle with a diameter of 40km. The craft’s propulsion comes from the interaction between this tether and the hydrogen and helium nuclei that form most of the mass of the solar wind. These nuclei are positively charged. And so is the tether, because the craft also carries a solar-powered electron gun that shoots out into space a stream of electrons scavenged from the wires. Since electrons are negatively charged, ejecting them in this way keeps the tether positive. Since like charges repel, the positive tether reflects the positive hydrogen and helium nuclei back where they came from. And since to every action there is an equal and opposite reaction (Newton’s third law of motion), that reflection drives the spacecraft forward. If the tether were stationary with respect to the craft, the result would be a lopsided force. But because it rotates, that force evens out after an entire circuit, propelling the craft ahead. Varying the output of the electron gun, however, can create a lopsided force deliberately, permitting the craft to be steered. And, though the acceleration produced is small (1mm per second per second), there is little in the vacuum of space to slow the craft down. It can therefore reach a speed of tens of kilometres per second after a year of travel, making its rapid jaunt to the asteroid belt possible. In addition to the E-sail, the craft Dr Janhunen envisages would have a small telescope on board, and also an infra-red spectrometer. These would analyse the surface of every asteroid encountered. Each probe would be able to fly to within 1,000km or so of six or seven asteroids, snapping photos and collecting data. Probes would not have the power to broadcast these data all the way back to Earth from the asteroid belt. But they would, instead, be able to store them in flash-memory chips, for relay to Earth on their return home. In some ways an E-sail resembles a solar sail, a rival idea for powering craft cheaply through space. A solar sail provides propulsion because the sunlight it reflects exerts pressure on the sail, pushing it forward. But E-sails have an important advantage over solar sails. Once unfurled, there is no easy way to stop a craft with a solar sail gathering speed. An E-sail-powered craft can be prevented from accelerating simply by switching off its electron gun. This means it can return to Earth under the influence of the sun’s gravity. E-sails have, however, not been tested. A solar sail has. Ikaros, a craft launched in 2010 by JAXA, Japan’s space agency, successfully deployed such a sail with an area of 196 square metres. Dr Janhunen hopes to make a start on proving his technology by unwinding a tether 100 metres long in space later this year. For those of a romantic disposition, E-sails may come to be seen as the technology that will unlock the asteroid belt for commercial exploitation. There is reason to believe that some asteroids are rich in valuable metals, such as platinum and iridium. Craft equipped with many tethers could carry heavy payloads—perhaps up to a tonne—that would permit mining equipment to be deployed and cargoes of metal to be brought back to Earth. One day, perhaps. But, in the meantime, E-sails do sound a plausible way of extending humanity’s understanding of the nearby cosmic neighbourhood. This article appeared in the Science and technology section of the print edition under the headline "E-sail away"
Czyżby kolejny pomysł na szybszy transport kosmiczny ? A to czy to jakiś nowy sensowny pomysł na produkcję i wykorzystanie antymaterii do napędu ? Tak się zastanawiam czy to jest realnie możliwe do skonstruowania? cytat"A fusion rocket system that worked for a few weeks at 100 MW would still be far better than any ion drive we have now and better than chemical rockets for deep space missions. Even if the fusion rocket did not generate energy but required more energy that it put out the system could still be useful."